This Sunday—the first Lords Day of 2018—we launched a discipleship effort for our congregation that involves the use of an ancient teaching technique known as catechism. The word Catechism comes from a Greek word κατηχέω (katecheo), which is a term used to describe communication of information and instruction. As Christians, we are deeply concerned that our community is one marked by communication of biblical information and godly instruction for life in Christ. Jesus commanded His church to be committed to the mission of making disciples. Our Lord specified that this mission would require instruction and teaching of information about Him (His identity and work), sound doctrine and sacred Scripture. Catechism is a tool for discipleship, proven over thousands of years of history to faithfully communicate or pass down Christian truth to both purify the church’s worship and also secure an understanding of sound doctrine in the next generation as we await the return of Christ (cf. 2 Timothy 2:2, 4:1-5). Beyond the act of communicating, the word catechism is used to denote a particular kind of communication, that is, oral teaching. It is a sort of verbal training, from a teacher to a student, which involves the use of memory, specifically the memorizing of theological truths related to our historic faith and the proclamation of the gospel. In the context of the church, a teacher of catechism is called a “catechist” and the student is referred to as the catechumen. This word—catechumen—comes to us from a Latin word, catechumenus, which comes from a Greek word κατηχούμενος (katēkhoumenos) that literally means, “one who is being instructed.” Katēkhoumenos Is an interesting compound word, from the preposition κατά (kata) meaning "down" and the noun ἦχος (ēkhos), which is a word for "sound." Literally, it is passing down knowledge through sound, that is, speaking truth and having it repeated back. In the discipline of catechesis, the teacher passes on knowledge by memory. The instruction is often arranged in the form of questions and answers. The catechumen memorizes the answers to questions and then is tested by questioning. It is expected that the catechumen repeats back the answer verbatim and further is able to explain the content and also tie it to Scripture. The use of memory for discipleship is biblical. Memorizing Scripture and quizzing in it was a critical component of faith in ancient Israel (cf. Deuteronomy 6:1-6) and in the church of Jesus Christ in the New Testament. Jesus was known for quoting Scripture and Creed, which He passed down to His disciples who also exhibited an oral command of the Bible and doctrinal confessions. In fact, their writings, we see Jesus’ disciples use the word katecheo (1 Corinthians 14:19, Galatians 6:6, Acts 18:25) and their disciples were known for verbal instruction. Ancient Christians wrote catechisms. What is called the Apostles’ Creed was probably framed for the use of catechumens. The early church utilized memory for passing on sound doctrine. Popularly, Cyril of Jerusalem in the 300s gave twenty-three lectures to catechumens. Augustine of Hippo, the early Roman African church leader, wrote The Enchiridion for catechetical instruction. Zooming ahead in church history, in the Protestant Reformation, catechism were absolutely critical in confronting the errors of European Romanist religion. The leaders of the Reformation in Europe, labored to write and memorize catechisms that uplifted the glorious gospel of God for making disciples. In Germany in 1529, Martin Luther wrote his Small Catechism. In Geneva, Calvin published his Instruction et confession de foy in 1537 and the Geneva Catechism in 1541/42. In England, there was Nowell’s Catechism (1563), the Prayer Book Catechisms (1549, 1604), and the Westminster Larger and Shorter Catechisms (1647). Perhaps one of the most famous catechisms of the Reformation was the Heidelberg Catechism of 1563. There isn’t time to survey all of the rich catechisms of the Reformation here: however, it is worth noting that they continued be written for newer generation and these older ones also continued be recited as well. This brings us to 2018 and our church launching a church-wide effort this year to experience discipleship through the ancient pedagogy of catechism. While the catechisms of the ancient church and Reformation are very important to study, they are laborious to commit to memory. That said, the truths of these catechetical confessions need to be understood and disciples of Jesus should be familiar with these texts and corresponding Confessions in church history as they are a rich well of blessing. In terms of memory, modern catechisms are typically easier to get down and still very rewarding, especially when paired with a familiarity in the older catechisms, confessions and creeds. In 2012, there was a modern catechism written by the folks at the Gospel Coalition that incorporated the rich truths and doctrines of the Reformation and the ancient church in a concisely worded catechism. The named it the New City Catechism. In addition to writing this helpful resource, the creators spent a great deal of time, creativity and money in creating a free smartphone app that helps students with memory and also devotions around Christian doctrine. The catechism consists of 52 questions and answers, which can be done one week at a time over the course of a year. 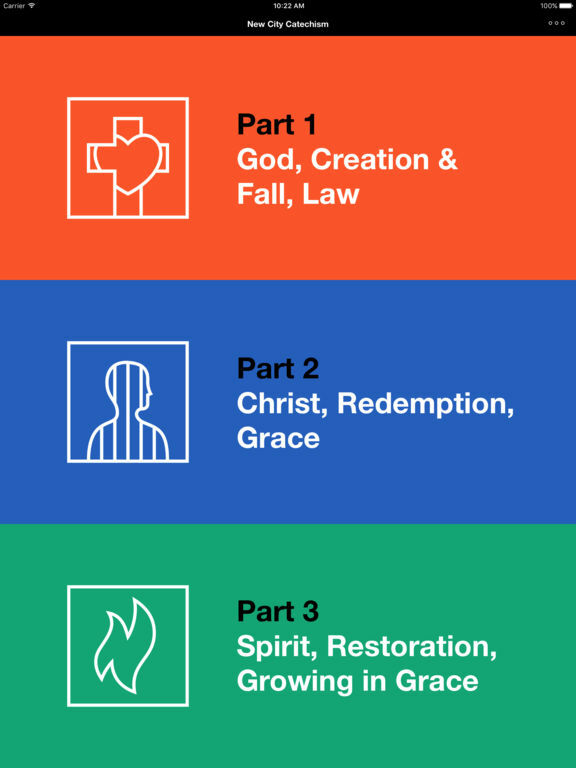 The year itself breaks down into three main categories or parts of Christian doctrine that are all fundamental to and flow from the gospel, namely: (Part 1) God, Creation, Fall & Law; (Part 2) Christ, Redemption & Grace; and (Part 3) Spirit, Restoration, & Growing in Grace. As a church, we plan to tackle one question each week of 2018 and we're hoping everyone--young and old--will join with us in this discipleship effort to memorize together sound doctrine as an act of worship before our God, who is conforming us into the image of the Son. 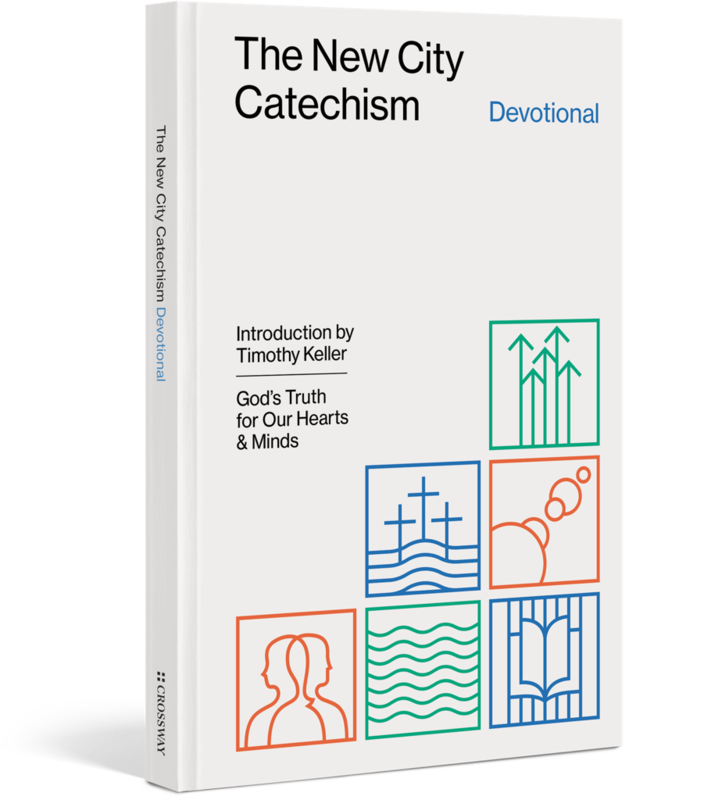 The New City Catechism is very worshipful and designed for community. The answers are designed for both children and adults, providing catechumens with shorter responses for the young and lengthier replies for adults (and older children). The shorter answers have even been put to song to help kids memorize. The larger answers are matched online with videos of leading evangelical thinkers, explaining in further depth the doctrinal and Scriptural underpinnings of the content. Given the theological videos, the musical and technological resources, this seemed to be an excellent resource for our church to use in 2018 as we seek to be faithful disciples making disciples. We have purchased in bulk copies of the catechism in print. The design of the book is superb. It has a question on one side of the page and the next page has the answer, so one can easily cover the page and quiz oneself. As well, in the bottom right hand corner, there are scripture references for study. The free smartphone app is available online for both Apple and Droid phones. It is formatted just like the book, in such a way that one can quiz him/herself and it features interactive elements as well. Along with the app and the printed book, there is also a devotional book that can be purchased that is loaded with edifying readings and prayers for use in your home. This devotional features readings from the leaders of the Reformation (for example John Calvin) and also contemporary evangelical leaders. In the coming weeks as we study this catechism together, we will be sharing resources with you online on our church website, so stay tuned. Our DRC Children's Ministry is working on supplemental resources that we will make available online for free for parents. As well, we are working on a Spanish translation (which we have in our hands right now) and ways to share with Spanish speakers in our church. As time permits, I hope to offer some blogs on the weekly questions providing supplement reading for you and in some weeks I will even quibble a little with wording to make things really fun. On that note, one wording quibble I initially with the catechism was the use of the word "city." Why call it a city catechism? Can't people in rural settings use this too? Anyway, the makers of the catechism are known for their heart for urban ministry and plant churches in major cities for gospel impact, so I get why they named it that, but still I would have named something more general like 'evangelical gospel catechism' or whatever. That said, minus a few quibbles over some words here or there, this thing -- the New City Catechism -- is an amazing resource. I am praying the Lord will use it powerfully in our congregation to solidy our convictions in the gospel and stir us to action as we seek to reach the city of Los Angeles with His good news. William Arndt et al., A Greek-English Lexicon of the New Testament and Other Early Christian Literature (Chicago: University of Chicago Press, 2000), 534. Matthew 28:18–20, Mark 16:14–18, Luke 24:44–49, Acts 1:4–8, and John 20:19–23. Question 2. What is your only comfort in life and death? Today many churches and Christian organizations publish “statements of faith” that outline their beliefs. But in the past it was expected that documents of this nature would be so biblically rich and carefully crafted that they would be memorized and used for Christian growth and training. They were written in the form of questions and answers, and were called catechisms (from the Greek katechein, which means “to teach orally or to instruct by word of mouth”). The Heidelberg Catechism of 1563 and Westminster Shorter and Larger catechisms of 1648 are among the best known, and they serve as the doctrinal standards of many churches in the world today. There are many ancient, excellent, and time-tested catechisms. Why expend the effort to write new ones? In fact, some people might suspect the motives of anyone who would want to do so. However, most people today do not realize that it was once seen as normal, important, and necessary for churches to continually produce new catechisms for their own use. The original Anglican Book of Common Prayer included a catechism. The Lutheran churches had Luther's Large Catechism and Small Catechism of 1529. The early Scottish churches, though they had Calvin’s Geneva Catechism of 1541 and the Heidelberg Catechism of 1563, went on to produce and use Craig’s Catechism of 1581, Duncan’s Latin Catechism of 1595, and the New Catechism of 1644, before eventually adopting the Westminster Catechism. Puritan pastor Richard Baxter, who ministered in the seventeenth-century town of Kidderminster, wanted to systematically train heads of families to instruct their households in the faith. To do so he wrote his own Family Catechism that was adapted to the capacities of his people and that brought the Bible to bear on many of the issues and questions his people were facing at that time. Catechisms were written with at least three purposes. The first was to set forth a comprehensive exposition of the gospel—not only in order to explain clearly what the gospel is, but also to lay out the building blocks on which the gospel is based, such as the biblical doctrines of God, of human nature, of sin, and so forth. The second purpose was to do this exposition in such a way that the heresies, errors, and false beliefs of the time and culture were addressed and counteracted. The third and more pastoral purpose was to form a distinct people, a counterculture that reflected the likeness of Christ not only in individual character but also in the church’s communal life. When looked at together, these three purposes explain why new catechisms must be written. While our exposition of gospel doctrine must be in line with older catechisms that are true to the Word, culture changes, and so do the errors, temptations, and challenges to the unchanging gospel that people must be equipped to face and answer. 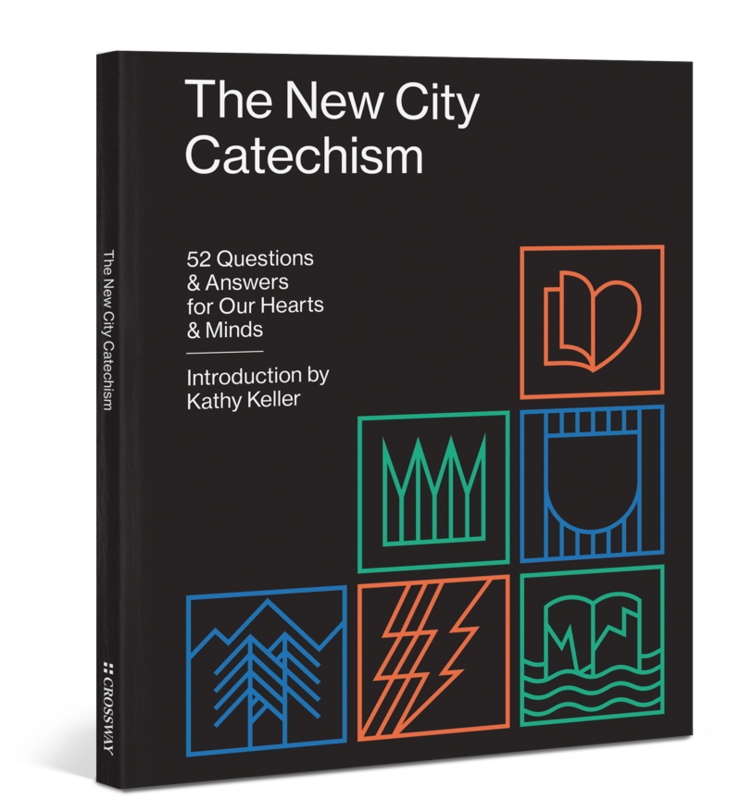 The New City Catechism comprises only 52 questions and answers (as opposed to Heidelberg’s 129 or Westminster Shorter’s 107). There is therefore only one question and answer for each week of the year, making it simple to fit into church calendars and achievable for people with demanding schedules. 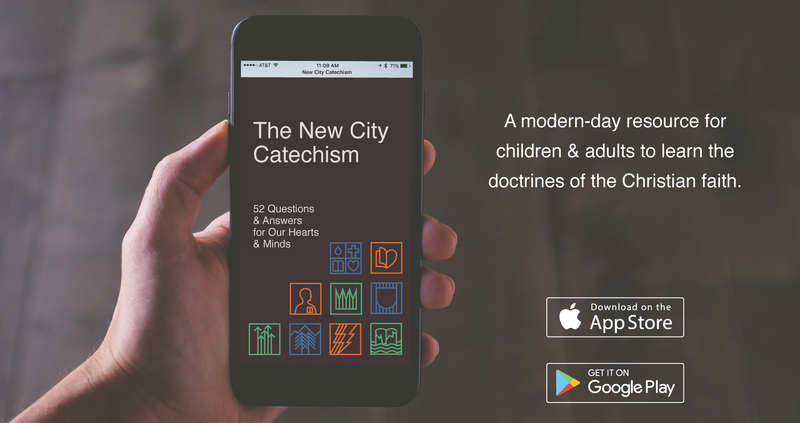 The New City Catechism is based on and adapted from Calvin’s Geneva Catechism, the Westminster Shorter and Larger catechisms, and especially the Heidelberg Catechism. This gives good exposure to some of the riches and insights across the spectrum of the great Reformation-era catechisms, the hope being that it will encourage people to delve into the historic catechisms and continue the catechetical process throughout their lives. As with most traditional catechisms, a Bible verse accompanies each question and answer. In addition, each question and answer is followed by a short commentary taken from the writings or sayings of a past preacher as well as a commentary from a contemporary preacher to help students meditate on and think about the topic being explored. Each question ends with a short, original prayer. Although it may make the content seem less accessible at first glance, the language of the original texts has been retained as much as possible throughout the historical commentaries. When people complained to J. R. R. Tolkien about the archaic language he sometimes used, he answered that language carries cultural values, and therefore his use of older forms was not nostalgia—it was principled. He believed that older ways of speaking conveyed older ways of understanding life that modern forms cannot convey, because modern language is enmeshed with modern views of life. For this reason, except in cases where the words are no longer in common use and are therefore incomprehensible (in which instances they often have been replaced with ellipses), the language and spelling of the original authors has been retained throughout the historic commentaries. Occasionally this language is also reflected in the questions and answers where the more poetic forms aid memorization. 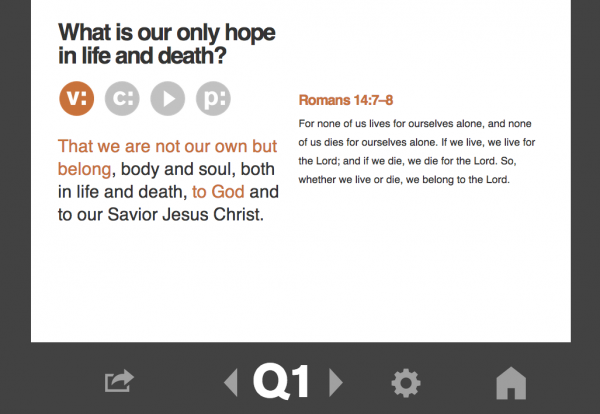 The easiest way to use The New City Catechism is to memorize one question and answer each week of the year. Because it is intended to be dialogical, it is best to learn it in pairs, in families, or as study groups, enabling you to drill one another on the answers not only one at a time but once you have learned ten of them, then twenty of them, and so on. The Bible verse, written commentary, and prayer that are attached to each question and answer can be used as your devotion on a chosen day of the week to help you think through and meditate on the issues and applications that arise from the question and answer. Groups may decide to spend the first five to ten minutes of their study time looking together at only one question and answer, thus completing the catechism in a year, or they may prefer to study and learn the questions and answers over a contracted length of time, for example by memorizing five or six questions a week and meeting together to quiz one another and discuss them, as well as read the accompanying commentaries. Read the question and answer out loud, then try to repeat them without looking. Repeat. Record yourself saying all part 1 questions and answers (then part 2, then part 3) and listen to them during everyday activities such as workouts, chores, and so on. Make flash cards with the question on one side and the answer on the other, and test yourself. Write out the question and answer. Repeat. The process of writing helps a person’s ability to recall text. In his letter to the Galatians Paul writes, “Let the one who is taught the word share all good things with the one who teaches” (Gal. 6:6). The Greek word for “the one who is taught” is katechoumenos, one who is catechized. In other words, Paul is talking about a body of Christian doctrine (catechism) that was taught to them by an instructor (here the word catechizer). The words “all good things” probably mean financial support as well. In this light, the word koinoneo—which means “to share” or “to have fellowship”—becomes even richer. The salary of a Christian teacher is not to be seen simply as a payment but a “fellowship.” Catechesis is not just one more service to be paid for, but is a rich fellowship and mutual sharing of the gifts of God. If we re-engage in this biblical practice in our churches, we will find again God’s Word “dwelling in us richly” (see Col. 3:16), because the practice of catechesis takes truth deep into our hearts, so we think in biblical categories as soon as we can reason. 1. Gary Parrett and J. I. Packer, Grounded in the Gospel: Building Believers the Old-Fashioned Way (Grand Rapids, MI: Baker, 2010), 16.